Chatting to Globe CSR right now to resend my service book. May hotspot is working again. hi, i’d like to ask if you know how to use bbmaz as dial up? my phone has no hotspot capability (torch), but i have researched that i can do tethering instead. my device is already paired up with my laptop via bluetooth. it was said that i need to do dialup to connect to internet using my BB. i want to use my bbmax service, but i don’t know what to input on the field requiring the traditional card number and password in a dial up setting. Hi. What if im going to register for 1month bbmax? after the globe refresh my service book it will expire by 1month? If your BBMax expired, you need to contact Globe again to refresh your service book. Sometimes CSR will not resend your service book. You can contact them again. Wait for SMS confirmation or observe the 2 diagonal arrows (sending / receiving data) at the right top corner of the screen, when it stops, perform a hard reset by pulling your battery while your BlackBerry is ON and reinsert again in a few seconds. 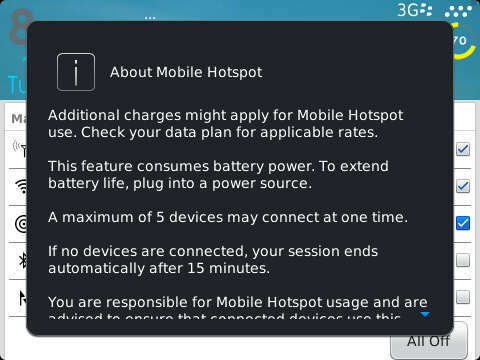 Hi, I’m on Postpaid and registered to BBMax, but I can’t use mobile hotspot. I already contacted Globe to refresh my service books, requested for the APN settings, done hard reset several times but it is still not working. Error on mobile hotspot: ”Activation required, to use this feature, contact your wireless provider and subscribe to a mobile hotspot data plan”. Please help me. Thank you in advance. APN enabled? If you are on Postpaid, no need to refresh your service book. Ask Globe, why you can’t use your mobile hotspot. I called globe lots of times already asking to refresh my service book. But they keep on telling me that its for postpaid users only. Is there anyway i can outsmart them by this? She also told me that some globe users did go around their said terms. What am i suppose to do? Thank u. Because you are telling for mobile hotspot. Just simply say, refresh your service book. When CSR ask you why, say, because you can’t browse the internet. When CSR says is there any error/s, say, “no error”. Is it same on touch mobile? Make sure you have a good signal. Or you can perform hard reset by pulling your battery while your BlackBerry is on and reinsert again.